Several years ago I spotted a somewhat ragged Echinacea plant at our local nursery. It was toward the end of the summer when the nursery had deeply discounted its remaining plants to clear its inventory. This poor little soul lingered in her pot so sadly that I simply could not walk away. I brought her home and planted her in the part of my garden between Marshmallow and Rose, uncertain if I would see her next year. However, as winter warmed to spring then into summer, there was Echinacea small but making a vibrant comeback. I had always wanted to plant Echinacea to use in making tincture. Echinacea, more commonly known as Coneflower, is a member of the Asteraceae or aster/daisy family. It has a long history of indigenous use for treating sore throats, coughs, headaches and infection. It is considered antimicrobial, anti-inflammatory, antibacterial, antifungal and antiviral as well as thought to stimulate the immune system. The three types of Echinacea most commonly used for medicine are Echinacea purpurea (Purple Coneflower), Echinacea angustifolia (Narrowleaf Coneflower) and Echinacea pallid (Pale Purple Coneflower). A fourth – Echinacea tennensiensis (Tennessee Coneflower), is considered an endangered plant and should never be used. Purple Coneflower (Echinacea purpurea) is the one most often found in gardens as it tends to be less demanding to grow. Most of what I read about Echinacea indicated that although the seeds, flowers and leaves have some medicinal value, the plant’s roots contain more potent medicine. Purple Coneflower has small roots whereas Narrowleaf Coneflower and Pale Purple Coneflower have long taproots making them better suited when using roots for preparing medicine. If you do not grow your own Echinacea, I very strongly caution you against wildcrafting it as Echinacea spp (spp is the botanical abbreviation for all species in a genus) is listed as an ‘At Risk’ plant by United Plant Savers. If you purchase dried Echinacea to make medicine instead of growing your own, please, please, please help protect our at-risk and endangered plants by making certain your source was grown organically for harvest and not taken from the wild. As fall rolled around and the Echinacea plant in my garden held onto her last few summer flowers, I just did not feel right about sacrificing the entire plant to harvest her roots, so I just left her. The following summer, Echinacea was beautiful with many more flowers and obviously enjoying her garden home. Again, fall came and I chose to simply do nothing with her roots. I began reading Henriette Kress’s wonderful book, Practical Herbs, and was fascinated by her discussion of Echinacea. Henriette noted that the above ground parts- the leaves, flowers and seeds are all effective medicinally as is the root. I began planning how I could use Echinacea without disturbing her too badly. When Echinacea sprouted her new leaves the next spring, but before her flowers began to open, I harvested enough leaves (when chopped) to loosely fill an eight ounce jar. I added enough 65% alcohol to cover the leaves, capped it tightly and allowed it to sit in my herb cupboard for about six weeks, shaking it twice daily for the first two weeks, then every so often afterward. I strained the tincture and returned it to the cleaned jar, this time adding several newly opened flowers (cleaned and chopped). I topped off the alcohol to cover the flowers, capped it tightly and proceeded as before, waiting another six to eight weeks. By this time, the Echinacea seed heads were beginning to ripen. The ripe seed head of the flower has a prominent ‘cone’ shape with the petals drooping downward as opposed to the more flat center and daisy-like appearance of new flowers. I picked several of these ‘ripe’ flowers and chopped them up, attempting to crush the seeds (a little more difficult to crush than I thought). After straining my tincture, I added these chopped seed heads to the jar, again topping it off with more 65% alcohol to cover the flowers, capping it tightly, shaking it periodically and allowing it to ‘brew’ for another six weeks. As we head into the last few weeks of December, I am convinced that my Echinacea tincture has helped ward off some of the nasty ‘bugs’ I seem to catch this time every year. I work in an office building, “The Land of the Gray Cubicles”, where colds and flues tend to spread rapidly among employees. This year, at the first sign of a scratchy throat, a dry cough or just feeling achy and tired, I took a dropperful of the Echinacea tincture in the morning, and sometimes in the evening, and continued taking it for at least a week. So far, so good-I seemed to have escaped almost all my co-workers illnesses and the one I did have, was quite minor and short-lived. During a severe cold or flu, Echinacea can be taken with other herbal preparations, such as Elderberry ((Sambucus niagra) or Oregon Grape root (Mahonia spp) to boost its effectiveness and there are several companies which offer Echinacea tincture combinations. 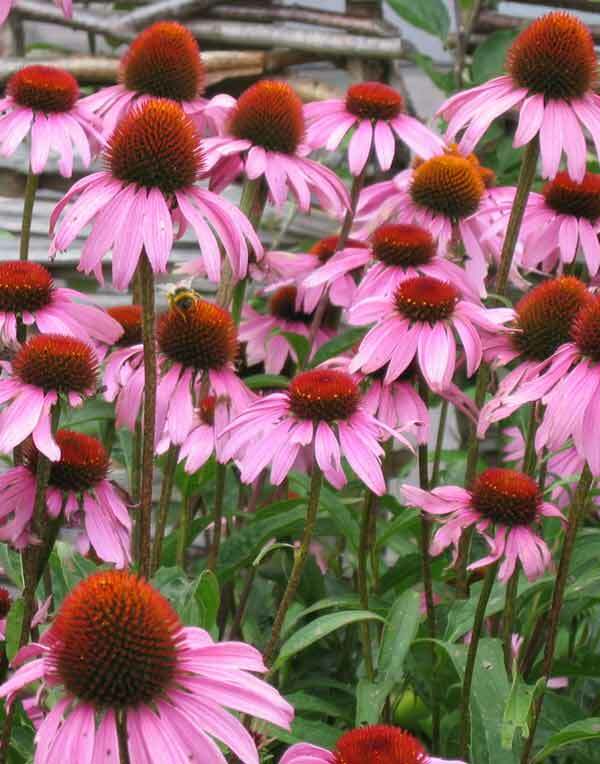 There seems to be differing opinions as to how and when to use Echinacea. Some sources say it should only be used at the onset of cold or flu symptoms and for no longer than ten days. Others indicate that taking Echinacea on a daily basis can help boost the immune system, especially for those individuals who are prone to illness, preventing many colds. There is some debate as to whether Echinacea should be avoided by those with an autoimmune disorder or HIV. However, this does not appear to have been well-studied or well-supported by the current literature. I have also read that once you have an active case of the flu, Echinacea will do little to help. All pretty confusing, isn’t it? As with many things in life, how you choose to use Echinacea will be up to your own unique needs. Research the available literature and make your own well-informed decision of what is best for you. If you are allergic to ragweed, use Echinacea with caution. If you are pregnant, as with any herbal or botanical preparation, do not use without first discussing with your healthcare provider. -Kress, Henriette. (2011). Practical Herbs. Finland: Yrtit ja yrttiterapia Henriette Kress.